Hello! I am Trudi (Geertrui in Dutch, and yes, that’s Gertrude 😉 ), nearly 50 and living near Bruges (Flanders, Belgium). I went vegetarian in the mid nineties, and – together with my husband- went vegan around 2010. My main motive has always been the ethical perspective, although I am also inspired by the environmental and health aspects. After my studies in criminology and environmental sciences (1995) I spent some years as a research assistant exploring the sociology of human-animal relations, which resulted in my PhD on ‘antropocentrism and speciesism in contemporary criminology ‘ (Ghent University). In 2001 I initiated and edited the book ‘Mensen en Andere Dieren‘ (Humans and Other Animals). After my academic years, I worked in youth care, and as a policy advisor for the Flemish Government (Vlaamse Overheid). Since a couple of years, I am no longer professionally engaged, because of chronic diseases. So I am ‘at home’ now, where – together with my sweet and loving husband – I take care of our animal family, and enjoy getting my hands dirty in our veg garden. And, as you can tell by the number of restaurant reviews, we also enjoy exploring new restaurants, and the occasional city trip. Some more personal stuff on why I started blogging, interests in music, gardening and more in this interview (2017) . See also and this interview for The Vegan Rainbow Project (2018). I also blog about veganism and animal rights in Dutch on Graswortels (formerly Veggieleven), and some of those posts also appear translated here, and the other way around. And I’ve also made some vlogs about veganism and animal rights (in Dutch so far). You can also follow me on Facebook Graswortels , Facebook The Bruges Vegan, Facebook Crip HumAnimal, Twitter, Google+ , Instagram, You Tube. All my posts are my own personal opinion. Great website! Keep up the good work and informing fellow vegans. Wish I’d seen your blog before I visited Bruges! Thanks for the wonderful thoughts and insights you’re providing. Keep up the excellent work! thanks heather, maybe you can stop by again on your next trip to Europe! I very much hope so! I fell absolutely in love with Bruges! Hi. It is lovely to connect with others who care. Bruge, I am told, is one of the most beautiful cities in the world. My son lived in Belgium for a while and I definitely want to visit. It is hard for vegans to find suitable restaurants so it is a wonderful idea to list these restaurants. We indeed speak Flemish and it’s amazing how much Afrikaans is similar! We visited SA in 2005 (Cape Town and surroundings) and absolutely loved it! Hope one day we can go visit again. Love to stay in touch with you and am following your blog! I am an omnivore but my husband & I eat vegan 5x/week! Great blog! great to have found your blog! nice! Very interesting blog. Would you like to contribute a guest blog post to mine (Discoveringbelgium.com)? You would be most welcome to. thank you! loved your blogpost about your visit to Bruges too. Lovely photos! hope you have a great time in Belgium! I can’t wait to read more. Great blog! Thanks! always nice to meet fellow vegan bloggers. And am following yours too! Nice to meet you! It is such a pleasure to connect with otther compassionate people around the world! thanks Carmen, happy new year to you too 🙂 Glad to have found your blog. 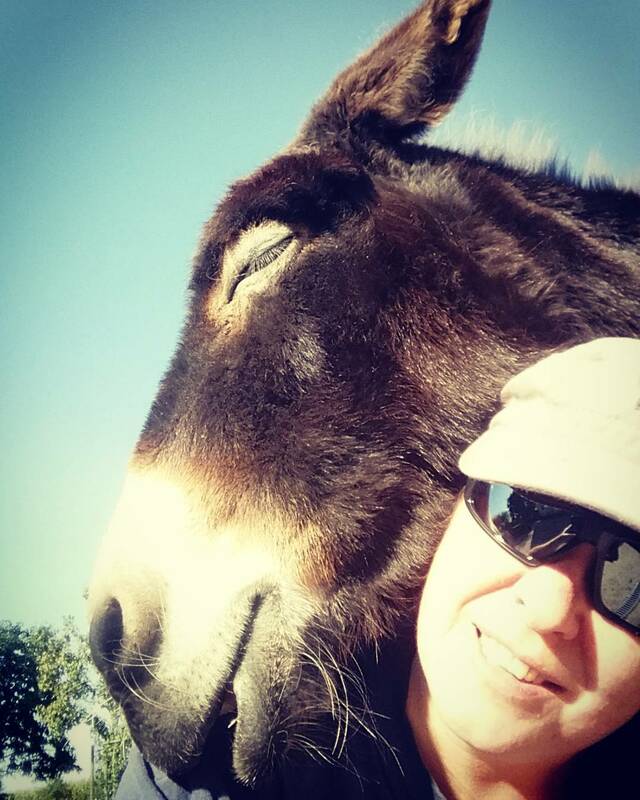 Glad to have discovered your compassionate blog through Emy’s untifur blog. Thank you for all the information you share. Thanks Carmen. Glad to have discovered your blog too. All the best to you and your loved ones for 2015! Thanks for all the likes!!! We love Bruges–visited again last Christmas & was totally charmed! PS, had fabulous hot chocolate in a coffee shop there. Can’t remember the name but remember how delicious! Nice blog. I still have some old Belgian Franc notes, the ones with James Ensor and Rene Magritte on. Thanks! Glad you have found our blog (there’s no link to your blog on your avatar, do you have one?). Memories! I think the James Ensor one was the 100 franks note? Ensor was from my home town Ostend (near Bruges). He played a big role in the foundation of the animal protection organisation Blauwe Kruis van de Kust ‘Blue Cross of the Coast’. And also had a painting againt vivisection: “Les Infâmes vivisecteurs”! I think that my avatar should now link to my blog. Thanks for the additional info about James Ensor. Maybe you could link that info to this site? I have a couple of books about him. I like the macabre humour in a lot of his pictures. Yes, the link is there now and I found your blog, which is very interesting! 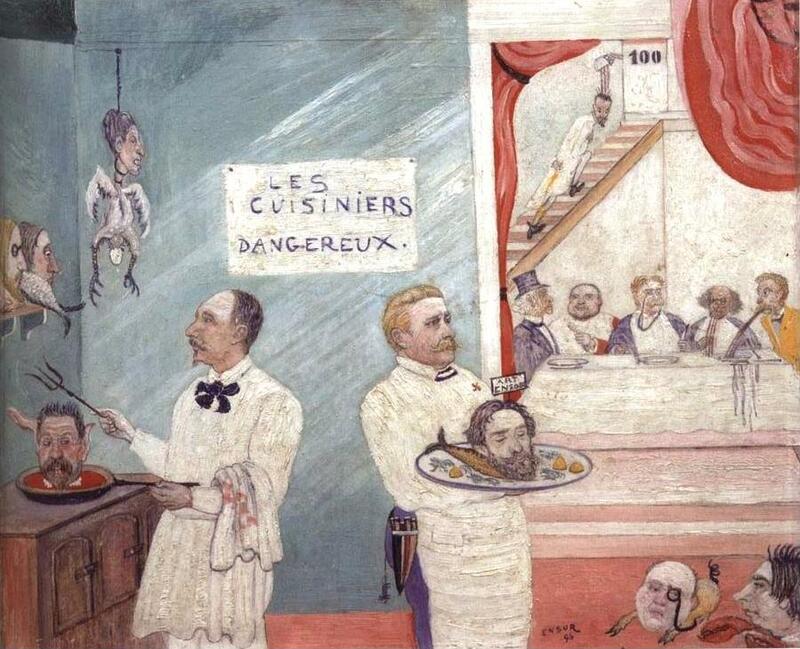 thanks, I love that painting (Les Cuisiniers Dangereux) too! Thank you so much for taking the time to follow my blog. I hope you enjoy it as much as I will yours. I have family in Belgium and it’s such a beautiful country – I spent a lot of my childhood summers in Brussels. I look forward to reading your future posts. Thanks for following! Glad to have discovered your blog too. I am loving your blog already! It is nice to follow vegans from Europe as it is probably completely different then being a vegan here in NYC. I look forward to reading about all the amazing cuisines. Thanks Bat-el. Vegan options are increasing across Europe, but we would love to go back to NYC one day, as we have never eaten so much as during the week we were there 😀 So many vegan options! It was great 🙂 Glad to keep in touch! She is the one who got me started on my vegan journey, a way of life that keeps me healthy and gives me joy and peace in my heart. How does Bruges compare to Ghent for eating vegan and buying organic produce? Thanks! Hi Maverick, I don’t really follow what’s happening in Ghent in detail, but Ghent is known as a hub for vegetarians (and increasingly vegans too). There are several all vegan restaurants, and plenty with vegan options. There’s also a vegan shop VEDGE (limited opening hours – check before). So definitely better scoring than Bruges (Ghent is also a bigger town than Bruges), although options are on the increase here as well. Hi, I live in Bruges and became vegan one week ago. This site is really helpfull to me. Thank you so much! Great website. My wife and I have been vegetarians for some 30 years now and, very slowly, we are edging our way to becoming vegan. Your website is a great encouragement.